Why is that shelf empty? A stockout, commonly referred to as an out-of-stock (OOS), begins with an empty shelf. They can be a result of a sold-out product not being replenished, a lack of inventory in the backroom, or inaccurate data from inventory systems. The only solution is to replenish the product to the right SKU on the shelf. Although this solution appears simple, it requires vast data collection and awareness of shelf status. How often do stockouts occur? Stockouts rank the second largest loss for brands in retail execution, right behind product voids. Studies over the past twenty years analyzed the occurrence of stockouts, and the data remains consistent. Stockouts in the fast-moving consumer goods (FMCG) industry average at around 8 percent but jump up to 10 percent for fast-sellers and brands on promotion. This means one in thirteen products will not be on the shelf on average. Even though technology has progressed over the past two decades, this problem has remained prominent and unresolved for many brands. The Harvard Business Review found that stockout problems can mainly be attributed to mistakes by retailers. As much as 72 percent of stockouts are caused by faulty in-store ordering and replenishing practices, whereas only 28 percent were found to be the result of supply chain mistakes. Retailers often will neither reorder on time nor order enough product, which generates inaccurate demand forecasts for brands. This can be because of the inefficient training of employees or system stocking mismanagement. Either way, store compliance is commonly poor, so the control feels like it is out of the hands of the brands. Many of the issues with stockouts are also linked to the frequency of reshelving. 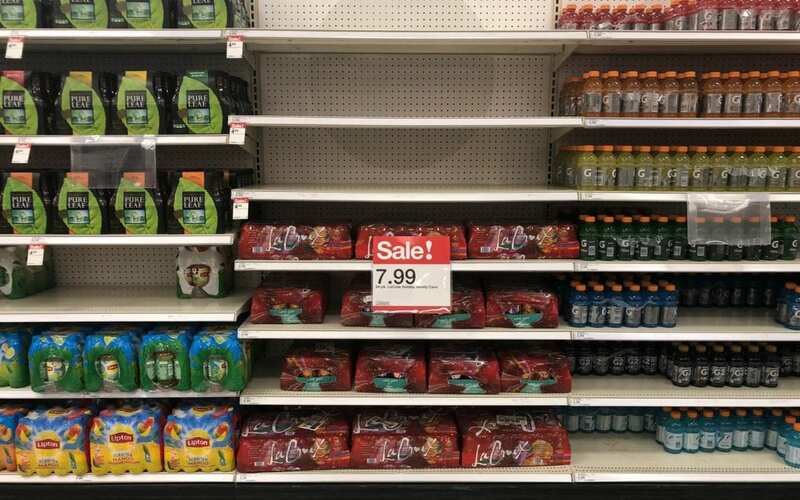 If a popular product sells out early in the day, but the store doesn’t replenish the shelf with the product in the backroom until the end of the day, it is preventing customer access to the product. The worst part of this type of stockout is that the product is in the store just not accessible. This, once again, is the responsibility of the retailer. With the frequency of stockouts so high, it is almost guaranteed that every company has faced this issue at some point. It is critical to address how much your company is losing, both in sales and beyond. To simply calculate the revenue cost resulting from stockouts, use this nerdy equation if you have the right information. However, your company can incur many other losses. The loss from OOS product leaks beyond sales. Promotional efforts like demos, displays, and coupons are common profitable efforts but lose their value when OOSs are present. The separate spending on promotional efforts becomes useless if no one can actually purchase the product. You are not only missing potential revenue but also wasting valuable expenses. Stockouts can quickly force currently loyal customers to settle for a competitor brand. If your product is not present, consumers will choose an alternative competitor brand 23 percent of the time. That loyal customer may now permanently convert to your competitor. Every OOS is more than a current loss but potentially a future loss. Is that someone else’s product? An empty shelf space and poor employee training can also result in a different product ending up above your SKU. If your product is the most popular and is commonly out of stock, it will allow mistakes in shelving to occur frequently. Not many consumers will look beyond the price on the SKU and can end up purchasing other brands taking up your shelf space. This results in the loss of a potential new customer. Most brands own up to the fact some products are more popular than others. If your most popular product is out of stock, that shelf space can often be filled with other less popular products. Although they are still your brand, it is going to decrease your sales if people are not willing to buy the other kind. Furthermore, the shelves will look full and be less likely to be restocked with that popular product. You get it now. Stockouts are a major problem for brands and must be addressed. Because most stockouts are caused by poor store execution, what role can brands play to address these early? How do they even notice them in the first place if their product is in thousands of stores across the country that all differ in their systems and management? Dealing with the variable retail compliance is the biggest hurdle to jump. Here is what you can do. Existing technologies give you information to track out-of-stocks, but a lot of improvement is needed to implement them. Here are the options and where they are limited. Aisle walks. One old-school solution is to go to all the stores and physically check if the product is there. It gives the most accurate data and allows for easy contact with the store management. Too bad this is impossible for brands that are nationwide because they do not have the funds or the staff to check every single store. Even by checking some stores, the frequency and timeliness will not be enough to address the problems quickly enough. Point-of-Sale stream. Valuable data can be gathered by this system to tell the average amount of product sold at specific times as well as if a product is not selling at all. The system can then estimate OOS issues, which seems perfect at first glance. Upon further review, it does have limits that hide important information. If a product is consistently out of stock and, therefore, not selling at all, the system will see this as the normal and not flag it. By not recognizing it, the problem will continue for an undetermined amount of time before it is physically recognized. This may account for a major portion of OOS issues, causing the losses to continue. “Smart” shelves. This new technology tracks the number of products on shelves and will even automatically reorder. As ideal as this sounds, it is currently extremely expensive to implement and manage. Most retailers are not willing to make this investment or figure out the technology. The most important parts about stockouts are finding them early and checking on them frequently. Through the nationwide user-base of the Observa application, the service is able to provide brands with real-time data of what their product on the shelves actually looks like. A better perspective of any store is available on demand, so brands are aware of stockouts early on. This on-demand store check ensures retailers are correctly placing the product and consumers are seeing it. You see where the problems are, so now what? If you managed to identify where your stockout problems are, that is already much further than a majority of brands get. It can be difficult to find out the frequency of stockouts, but even more difficult to address them. To address the issue of a product present in inventory but not reshelved enough, it can help to negotiate for more facings in the store or reallocate the current facings. By increasing the amount of product on the shelf per restocking period, this can prevent these types of stockouts. If one product with more facings isn’t doing as well as the stockout product, reallocating the number of facings for each product is a smart move. If it is an inventory issue, it is best to negotiate with the store to increase the order size if possible. Having more inventory in the back of the store can help the retailer restock with the appropriate amount of product. By investing in the right tools to identify stockouts and addressing problem areas, brands can drastically enhance retail execution. **If you are interested in what causes losses four times as extreme as stockouts, be sure to check out our blog on product voids!